Done in watercolor inks (which I haven’t used since 2009, but I wanted something permament once dry… and they’re pretty permanent), then acryla gouache on top of a layer of matte medium. I’ve been spending longer on my pieces than usual. I used to whip out a watercolor painting in a few days, but now I am enjoying slowly layering the colors and taking more time to get it right. Rebecca Guay introduced the mentorship class to her favorite medium – acryla gouache. They are really fun! Great for layering. They just work really nicely. I used them on my viking goddess painting too. Read more about the Pied Piper legend at http://en.wikipedia.org/wiki/Pied_Piper_of_Hamelin! Next up: I’m working on a portfolio piece with a larger figure in the foreground, a portrait, since we noticed my portfolio was lacking in those. We also just got our latest guest assignment in the mentorship, and I will definitely be chronicling the progress on this blog! David Saylor, a VP and CD at Scholastic, who art directed the Harry Potter book series, assigned us to do the cover of Harry Potter and the Philosopher’s Stone!!! AMAZING! (due April 6) And since I used to be a Harry Potter fanartist, as mentioned before… this is especially awesome to me. 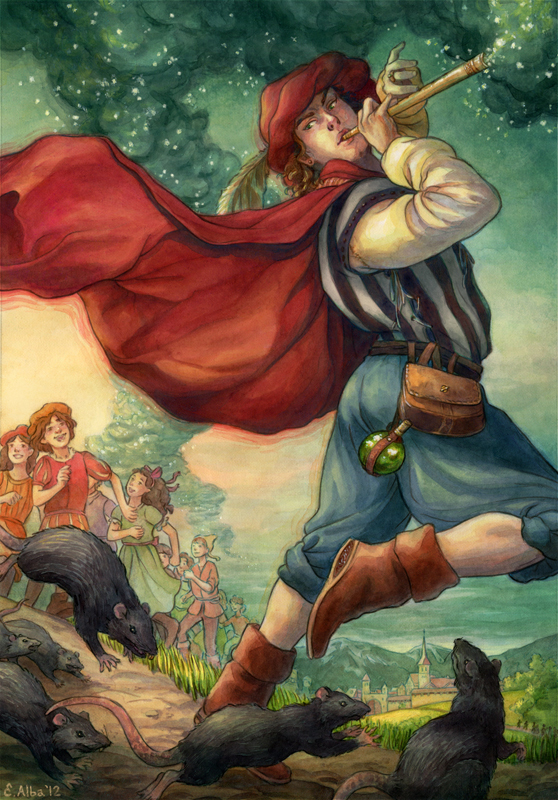 This entry was posted in artwork and tagged boy, children, children's book, fairy tale, fantasy, illustration, magic, pied piper, rats, watercolor. Bookmark the permalink.